The Episcopal “Daily Office” provides prayers and Scripture for various times of day. Derived from medieval monastic liturgies, the practice of hallowing the beginning, middle and end of our days with both corporate and private prayer can offer refuge and refreshment, lifting us out of the relentless rush of time to remember what it’s all about and deepen our connection with the holy One, who is our Source, our Companion, and our End. I have to confess that in the midst of my prayer time I succumbed to uncharitable amusement when I read these words. They describe the American president––and his corrupt and cruel minions––so perfectly! But neither righteous outrage nor satirical jesting––and certainly not any presumption of our own goodness––will deliver us from the menace of these times. Of course we must take sides against the malicious designs of evil tyrants in order to defend the vulnerable and preserve the common good. As Reinhold Niebuhr reminded my generation of theology students, trying to keep one’s own hands clean in a dirty conflict can be a form of capitulation. Sometimes our innocence must be sacrificed in the historical struggle for a better world. Dietrich Bonhoeffer knew this when he joined the plot against Hitler. But engaging the powers of darkness solely on their own terms is toxic, perhaps fatal, in the long run. If our goal is community and communion, we cannot make division and opposition our primary weapons. On the day following the assassination of Martin Luther King (and two months before his own violent end), Bobby Kennedy made this point boldly to an audience afflicted by passions of grief, fear and rage. Bells of warning should ring out Danger! in every city and town. Prophets should shout The end is near! on every street. Pundits may worry, dissenters object, and activists resist, but where is the widespread public cry of peril and alarm? Imagine such passivity after Pearl Harbor or 9/11. Are most of us still taking for granted our national stability? Do we simply assume everything will return to normal after the next two elections? In a recent Washington Post column, “Watch What Happens in Rome,” Anne Applebaum examines current Italian politics as a disturbing cautionary tale for the United States. After finally ousting a corrupt authoritarian leader, Italy failed to revert to a more benign and centrist public order. 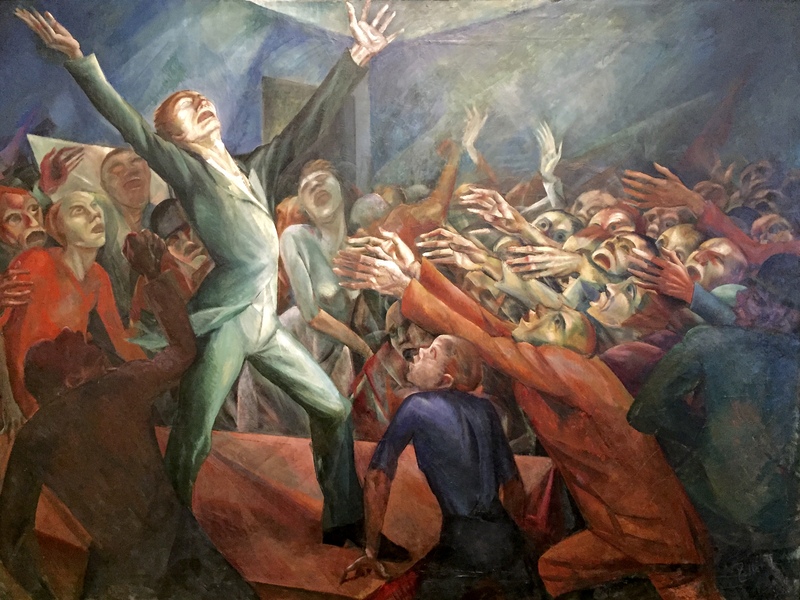 In encouraging contrast to such shameless apostasy, an ecumenical group of Christian leaders has issued a timely manifesto, “Reclaiming Jesus: A Confession of Faith in a Time of Crisis.” Click the link to read the whole text, and share widely. It’s a good theoretical foundation for a gospel-based resistance. Imagine our homes and families when love is the way. Imagine neighborhoods and communities when love is the way. Imagine our governments and nations when love is the way. Imagine business and commerce when love is the way. Let all the people say: Amen! [iii] Patrick T. Fallon, “The Banana States of America,” Washington Post, May 22, 2018. [iv] Anne Applebaum, “Watch what happens in Rome. It could be our post-Trump future,” Washington Post, May 18, 2018. [v] Leonard Pitts, “Oregon school district forced LGBTQ students to read the Bible––how Christian,” Miami Herald, May 17, 2018 (http://www.miamiherald.com/opinion/opn-columns-blogs/leonard-pitts-jr/article211384374.html). enters now the highest heaven. “Are you leaving us, O Compassionate? do you grudge even our brief delight? Where do you fly in such haste? Your departure, so splendid and bright! But how poor and blind you leave us! 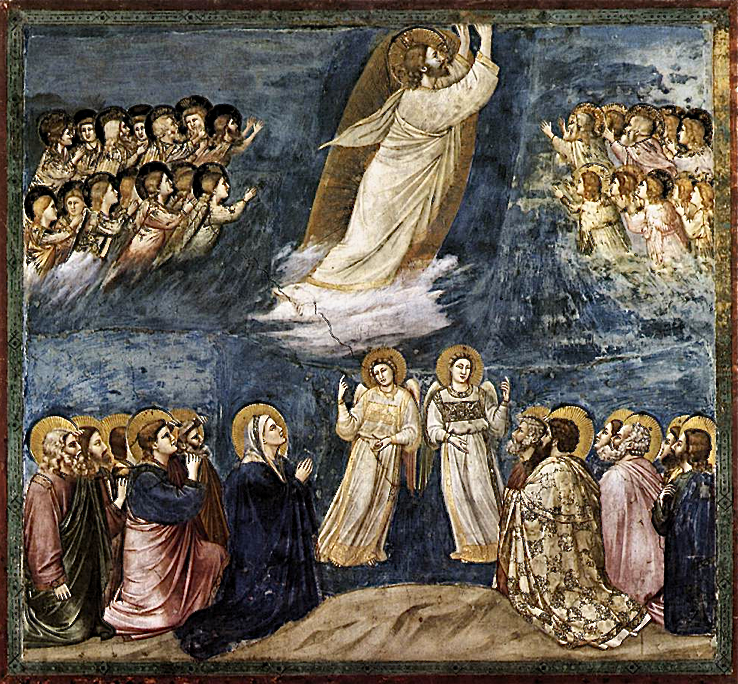 This is the fortieth day of Easter, Ascension Thursday, commemorating the cessation of resurrection appearances and the exaltation of Christ into a state of divine glory and universal presence. The liturgical texts and hymns are festive and celebratory: the divine fullness, hidden and humbled in the life of a first-century mortal, is lifted high once again, but without discarding the humanity assumed and hallowed in the Incarnation. By ascending, Christ does not abandon us to “earth’s broken Eden,”[i] but rather makes the way for us to follow, deeper and deeper into God. Our humanity, made glorious in Christ, is joined to divinity forever. Still, the day has always felt bittersweet to me. Amid all the festive imagery of a glorified Christ taking up his rightful crown as “cherubic legions shout him welcome to the skies,”[iii] and despite the promise that we now have a Mediator who, as one dear priest put it to me long ago, “whispers our prayers into the ear of the Father for all eternity,” a sense of ending and departure is there as well. The companion who once graced his disciples with the intimacy of daily presence, even after his death––where is he now? Divine absence is a common theme in our time. In the secular imaginary, where heaven is but empty space, the Ascension is a flight to nowhere. It’s not just a matter of declining interest in the labor of belief as other matters compete for our attention. For many, “God” is simply no longer even thinkable. Divinity seems a term referring to nothing in contemporary experience. The vocabulary and grammar necessary to speak God into being have become, for many, a dead language. Protective spirits hid themselves in subterranean beds of bubbling ore . . .
His son did not know his sonship and turned his eyes away when passing by a neon cross flat as a movie screen showing a striptease. . . The Ascension does not only signify absence, however. It also promises a new form of presence, which I have written about in “Ascension Day ‘Charade’: The Puzzling Exit of Jesus.” But absence is as fundamental to faith as presence, and deserves to be treated by Christian communities with equal respect and attention. Since most churches, unable to get good attendance at weekday liturgies, now celebrate the joyful glories of the Ascension on the Seventh Sunday of Easter, perhaps we should consider devoting Ascension Thursday to the honest contemplation of its shadow side. What if God’s friends were to gather annually in an “upper room” for an Ascension potluck or pub night to share their stories and their wonderings about the experience and meaning of divine absence? Might we then, like those first disciples left behind on the Mount of Olives, find the sincerity of our questions and the depth of our longing answered by the winds of heaven and the fire of unquenchable Love? be glad, and sing a new song. For everything that may happen, happens for your sake. It was for you I came down and went through all . . .
[i] Denise Levertov, “Ascension,” in Divine Inspiration: The Life of Jesus in World Poetry, eds. Robert Atwan, George Dardess, Peggy Rosenthal (New York: Oxford University Press, 1998), 567. [ii] John Donne, “Ascension,” in John Donne: The Complete English Poems (London: Everyman’s Library, 1985), 433-34. [iii] Isaac Watts, “Morning,” in The Sacred Harp (Bremen, GA: The Sacred Harp Publishing Company, 1991), #163t. [iv] Fray Luis de Leon, “The Ascension,” in Divine Inspiration, 566. [v] Czeslaw Milosz, “How It Was,” in Czeslaw Milosz: New and Collected Poems, 1931-2001 (New York: Ecco, 2003), 232-33. [vi] Romanos, “Kontakion on the Ascension,” in On the Life of Christ: Kontakia, trans. Archimandrite Ephrem Lash (New York: Harper Collins, 1995). and now here I am in the middle of one! The economy of nightmare demands waking. We organize, march, resist. We yearn for Mueller’s evidence and November’s Armageddon (though anxiously mindful of voter suppression, racial gerrymandering, Russian hacking and White House lawlessness). But even if we manage to throw the current rascals out, over a third of America will still be in love with disturbing ideas and ruinous behaviors. Malevolent lunacy is no longer confined to the fringes of American society. It has been openly embraced, endorsed, nurtured and exploited by the leaders and voices of the right, and it will not return to the shadows willingly––or, I fear, very soon. The actions of the ruling powers now appear utterly contrary to normative assumptions about ethics, rationality and common decency. How can they be saying such horrid and crazy things? How can they be doing such horrid and crazy things? The United States has become a land of crippling nonsense. Wonderland’s fascistic Queen is possessed by what Lewis Carroll described as “ungovernable passion––a blind and aimless Fury.”[iii] Sound familiar? As critic Gilian Beer describes Carroll’s dystopian fantasy, in the violent atmosphere of the tyrant’s court “there are rules but no order, voices but no listening, and assertions but no evidence.” The Queen of Hearts––long before Twitter––shouts “her mantra of ‘Off with their heads’ at the slightest show of resistance or misunderstanding.”[iv] In such a world, reasoned discourse is fruitless, and all our certainties come into question. In Wonderland’s sequel, Through the Looking Glass, young Alice does her best to establish a sense of firm reality within the unstable flux of Lewis Carroll’s narrative world. But Tweedledee infects her with radical doubt, telling her she’s only a figment of the Red King’s dream. “I am real!” said Alice and began to cry. Of course, Alice herself has been dreaming, and when she wakes up she sensibly declares: “I don’t like belonging to another person’s dream.” And with that her story ends, at which point the reader awakens as well, suddenly restored to the more stable “reality” of his or her familiar environment. But is that environment, the world in which we habitually live and move and have our being, just another dream as well? Can we rely on it? Can we trust it? Or must we wander forever in a hall of distorting mirrors, an endless maze of competing fictions and conflicting interpretations? Several centuries of epistemological doubt have severed the connection between words and things. Language and narrative are reduced to a play of arbitrary signs which say and mean whatever we want, with no necessary connection to real things or proven facts. In the objectless virtuality of the Internet Age, the world is not directly encountered, but only imagined. “Reality” becomes a construction produced by the subculture of our choice––or the choice of those who manipulate our thinking. Reality in such a circumstance is no longer a communicable experience which can be shared between opposing world-views. I, for example, am unable to comprehend the cruelty of the immigration storm troopers, the poisonous malice of the EPA administrator, or the murderous greed of the gun lobby. But in the world imagined by such people, it all makes perfect sense. As far as I know they all sleep with untroubled consciences. That’s why shame has proven such a feeble weapon of resistance. The liars, the haters and the destroyers take pleasure in what they do. I suppose we can find some small hope in conservatives’ visceral reaction to Michelle Wolf’s monologue at the White House correspondents’ dinner last week. When the comedian held up a mirror to Trumpian vulgarity, skewered the hypocrisy and heartlessness of the ruling powers, and named liars for what they are, the tuxedoed elite showed at least a vestigial capacity to be ashamed, resulting in a lot of misdirected anger but alas no repentance. Who will rescue us from this body of death? [viii] Is there no exit from the infinite maze of fatal illusions? Can we glimpse any possible truth beyond the self-referential confines of human imagination? 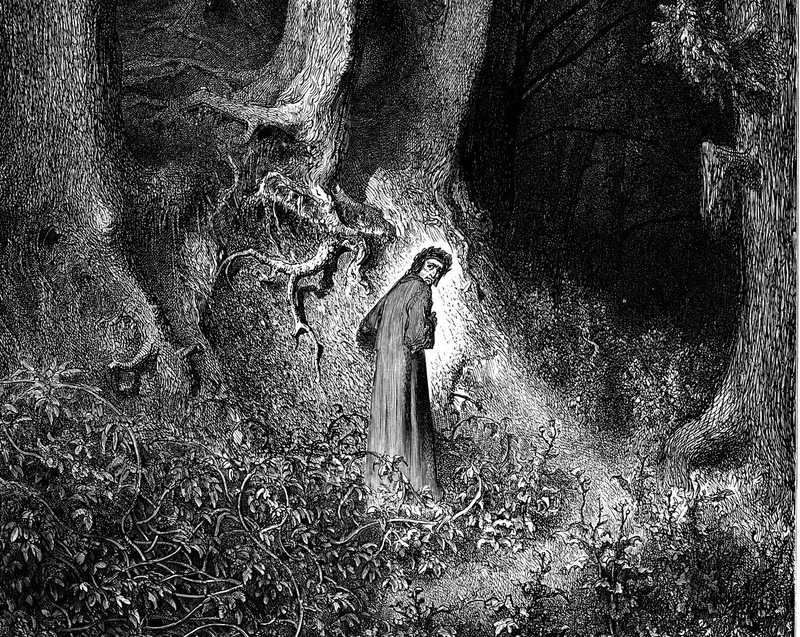 In his sublime Commedia, Dante trod the perilous pilgrimage from illusion toward ultimate reality. By narrating his journey from the selva oscura (”dark wood”) of human ignorance, folly and sin into the radiant smile of divine Love, he made his supreme fiction a vehicle for transcending every fiction, including his own. Let me suggest a few insights from the Inferno to provide perspective on our own predicament. First of all, the very structure of Hell clarifies the taxonomy of sin. The lower you go, the worse the offense. The upper level contains the “incontinent,” those whose will to resist evil and do good was weak or distorted. The next level down contains the violent, those who could not control the raging beast within them. But the lowest level (occupying fully half of the Inferno’s text!) is reserved for the fraudulent and the treacherous, who didn’t just make bad choices or surrender to impulse. These are they who deliberately undermined the foundations of human community, which needs mutual good faith and trustworthy behavior to function in a healthy way. When lies become the common speech and there is no reliable shared reality, we are all in the deepest pit of hell. The Inferno also raises questions of salvation and forgiveness. If we recoil at the apparent theology of eternal punishment so vividly described by the poet, we must remind ourselves that the Commedia is a fiction, using unreal means to convey real truth. As St. Augustine warned biblical literalists, “Whatever appears in the divine Word that can be referred to neither virtuous conduct nor to the truth of faith must be taken to be figurative.”[ix] Or as Dante scholar William Franke puts it, “the fantastic story exists for the sake of something that is supposed to be learned from it.”[x] In other words, the Inferno is about something other than the anger of a merciless god. So what are we to learn from the troubling images of infernal suffering? Franke observes that “the inhabitants of Dante’s Inferno are consistently shown to be damned by their own self-interpretation, their eternally stubborn resistance in refusing to understand themselves as God sees them.”[xi] At best, they continue to romanticize their illusions and idealize their failings. At worst, they cling to their bitterness and rage. Either way, says the poem, if you have no desire to be transformed, go to hell. But Dante’s poem is comedy, not tragedy, and the stasis of sin is not our fate. We are, in fits and starts, on the move toward bliss––but by no power of our own. Throughout this life and beyond, we are ultimately drawn and driven by Love divine. The way may be rough and steep, and Dante the pilgrim suffers the trials of every pellegrino. He grows weary, succumbs to fear, wants to turn back, encounters insurmountable obstacles. And yet, by the grace of God, he finds his way, even when there is no way. has the capacity to hold so much. (Inferno xxviii.4-6). [i] W.H. Auden, For the Time Being: A Christmas Oratorio, in Collected Poems, ed. Edward Mendelson (New York: Random House, 1976), 272. [ii] Lewis Carroll, Alice’s Adventures in Wonderland, q. in Gillian Beer, Alice in Space: The Sideways Victorian World of Lewis Carroll (Chicago: University of Chicago Press, 2016), 192-3. [iii] Lewis Carroll, q. in Beer, 208. [v] Lewis Carroll, Through the Looking Glass, q. in Beer, 161. [vi] Graham Ward on Certeau’s The Practice of Everyday Life (1984), in Cities of God (London & New York: Routledge, 2000), 73. [vii] Ward, Cities of God. The quoted phrase is from Michael Certeau, Culture in the Plural (1997), q. in Graham, 74. [ix] St. Augustine, in William Franke, Dante’s Interpretive Journey (Chicago: University of Chicago Press, 1996), 86. Citations from Dante’s Commedia are from Robert and Jean Hollander’s marvelous translations (New York: Doubleday: Inferno 2000, Paradiso 2007).